I haven’t knowingly eaten a non-organic apple in many years. I won’t even let my daughter eat apple slices from her school lunch service unless I'm assured they're organic. That's because, unless they're certified organic, those shiny red and green apples are often riddled with detectable amounts of dangerous chemicals and pesticides. If you read this blog, you’re aware that there are some foods I'm willing to buy that are not organic. Apples, however, aren't among them. Every year, a representative sample of random non-organic apples from retail outlets across the country are washed, cored, and peeled, then tested for pesticide residues by the United States Department of Agriculture (USDA). Their Pesticide Data Program (PDP) stores the results in a large database that is publicly reported. 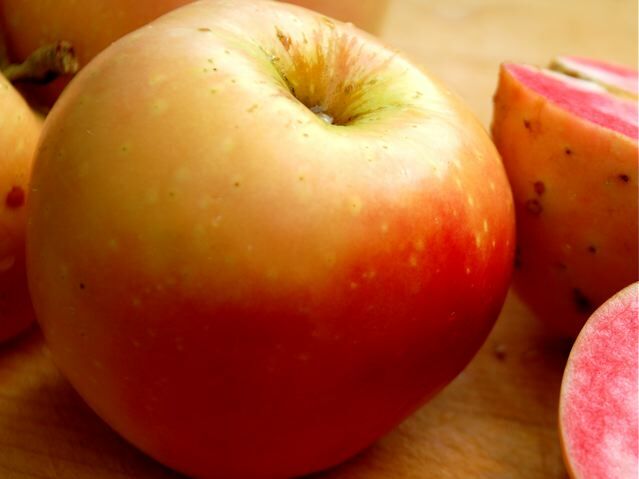 Year after year, apples are consistently in the USDA’s top-10 list of the most contaminated fruits. Even after being washed, cored, and peeled, an average conventionally grown apple contains detectable residue from 4 to 10 different pesticides known or suspected to cause nervous-system damage, cancer, and hormone interference. Chew on that before you take a bite of that pretty non-organic apple. Why are so many pesticides sprayed on apples? Apples are vulnerable to a number of insects and larvae that burrow into the sweet juicy fruit and destroy it. To fight pests, non-organic apples are sprayed with insecticides several times during the growth season, and are often sprayed after harvest with fungicides or petroleum sprays. Pesticides banned by the Environmental Protection Agency (EPA) because of their extreme toxicity, or pesticides that are almost banned, are still found annually on apple samples tested by the USDA. That's why non-organic apples scare me. They recently became even scarier because during 2007, the EPA quietly reauthorized the use of a previously banned pesticide called chlorpyrifos, a known neurotoxin and carcinogen, for use on apple crops. In response, a group of farm workers and advocates filed a lawsuit to force the EPA to stop the use of chlorpyrifos for agricultural use. Chlorpyrifos, marketed by the Dow Chemical Company, was also known by the brand name Dursban. Dursban was a commonly used household insecticide, primarily used as a garden pesticide and in flea collars, until tests showed it caused brain damage to animals. Because of its toxicity, the EPA banned chlorpyrifos for household use in 2000. At that time, the EPA acknowledged that children were particularly susceptible to ill effects from contact with this pesticide. When the EPA issued the ban, the agency said farm workers who mix chlorpyrifos (known by the brand name Lorsban for agricultural use), or apply it to fruit orchards using backpack hose sprayers or open-cab tractors, faced a “potentially unacceptable level of risk.” At that time, the EPA also said it wanted to research how chlorpyrifos mist drifting from agricultural fields or brought in the home on work clothing could expose vulnerable children to this dangerous pesticide. When the agency reauthorized the spraying of chlorpyrifos on farms last year, it did so without resolving those concerns. The reauthorization is not only bad news for consumers, but very sad news for farm workers and their families, who suffer many ill effects from exposure to this carcinogenic neurotoxin. While the use of chlorpyrifos has declined over the past 10 years, in part because of the recently reversed ban on its use, it is still one of the most widely used agricultural pesticides in the U.S. The majority of non-organic apple farmers in my home state of Washington spray chlorpyrifos on their apple crops. Given that apples are vulnerable to many pests, and organic growers are not allowed to use toxic pesticides on their crops, how do they produce viable apple crops? It takes a grower who cultivates biodiversity and natural predators, plus a lot of careful monitoring and hands-on involvement, to successfully grow organic apples. Organic apple growers spend a lot of time thinning out bad apples by hand and destroying them, which means lower overall crop yields per acre compared with conventional orchards. Organic growers battle apple pests by using non-toxic sticky traps for insects. They may also enclose each fruit in a breathable bag to keep insects out, or seal growing apples in a cornstarch-based coating that repels pests. All of that hands-on labor can be expensive, which is one of the reasons that organic apples often cost more. I strongly recommend that everyone avoid non-organic apples, particularly children and pregnant women. If you buy baby food, apple juice, or applesauce for your children, always choose organic. I think the price of organic apples is well worth the cost.